Archibald further states that the model is based on ” forces that dare not speak their name” (On WUWT). Leif comments that the mysterious force is “Astrology”. What I see here is a potential Dallton type minimum. I better than a Maunder, however. Back in February Tim Channon posted a solar prediction which showed exactly that. But I don’t think Tim’s prediction was based on forces that dare not speak their name. Unless “c*cles” really is a dirty word. 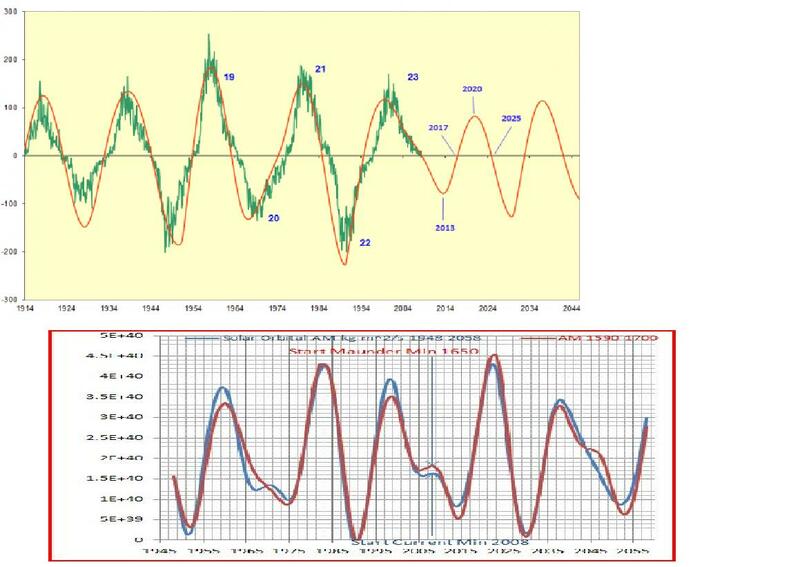 It seems true, however, that the peak amplitude of cycle 24 will be close to that of solar cycle 5, whereas a comparable peak was not observed in 1655. Bear in mind, however, that there were very few sunspot observers attempting to record sunspots in 1655, which was not long after the invention of the telescope. Also, the Little Ice Age weather at that time was extremely cloudy for long periods of time in Europe. The observations were also very spotty during solar cycle 5 as well, even though there were many more solar observers in that era. If there is a problem with barycentre theories it is the regularity of the effect, which grossly mismatches eg. earth observations. A good instance is the mimic of ~1815 in 1990. If there is a connection there is a large additional term, or perhaps inversion of sense but if so there must be a rational basis. Is this possible? Yes. this might be a baseline undulation as mentioned by Eddy. Doesn’t answer where it might come from. It might be news to say I am sitting on what looks like confirmation of part of the Wolf and Patrone paper. If this is confirmed it means there is a barycentre effect on the sun, if not quite as they posit. Dr. Lief’s first reaction in the thread was “astrology” and he has a number of comments since then, but I thought that post would be like the waving of a red cape and cries of “toro! toro!”…. except his replies have been pretty much of the “It’s not TSI, stupid” which most of us seem to accept these days, and nothing of his usual acidic responses to anything David Archibald says. Kinda makes one wonder … and Fred Fix’s comment is a delight. Perhaps the heliosphere is intended to be the unidentified interplanetary medium? The problem seems to be that the known properties of the heliosphere are not recognized by mainstream astrophysics as being compatible with such a model. Gerry, are you referring to this plot? Tim, I’ll happily publish your Wolff-Patrone observations if you wish. I’m not convinced it captures the whole of the possible effect though. It’s always good to read David Archibald… even at the cost of wading through the acidic puddles dripping from the Galatic Gatekeeper… talking of which… he was also acting as the Galactic Timekeeper last week in defence of Einstein over at WUWT… so I can only guest he has nothing better to do unless this is really part of his job description. TB: Holding off from revealing is probably right and leaves open collaboration. There is more but I can’t figure out how to communicate. is the barycentric solar angular momentum comparison plot to which I am referring. I think Ed Fix (fix ed) is Archibald himself, with a bit of a humour attached. It would be interesting to see that plotted throughout the sunspot record. Vuk, I doubt it. Some time ago David mentioned a person who had contacted him who had a good correlation for solar activity. I suspect it’s a minor variation on the work pioneered by Desmoulins, and carried forward by Ian Wilson, Ray Tomes, Roy Martin and others here on this blog and elsewhere. My guess is that ‘Ed Fix’ wanted to keep it under wraps but David couldn’t resist using it for a bit more publicity. Whatever, it’s all grist to the mill, and Anthony likes David, so the force which dare not speak its name gets an airing on a blog which still bans ‘barycentric discussion’. Gerry: Should we overlay the signed sunspots onto your graph? Instead use CoM (centre of mass) as a term. I’d never heard of the B. word until recently and it took a while to figure out ‘oh that’ ie. nothing. I do not see any copyright. This makes for a tricky situation. The intent is pretty plain but legally that is awkward if any derived works were produced. Yes, thank you, I’d like to see the overlay of signed sunspots on my graph, along with the mysterious red plot, but have been too busy to do it myself. I don’t expect the relative amplitudes to agree, but I think the time differences between peaks and troughs might be interesting. OK, now I gotta jump in! Surprisingly, I’m not David Archibald–I’ve never even met him. After I wrote the earliest version of this paper, I sent it to a few people (including Leif Svalgaard) for comments or suggestions. David was the only one who responded with any sort of constructive comments. Svalgaard didn’t respond at all. Actually, I understand Svalgaard’s position. People have been trying to nail down a planetary solution to the sunspot cycle since Wolf in 1859 with results that range from disappointing to tantalizing, but nothing anyone could really point to and say, “By Jove, that’s it! !” 150 years of promising beginnings was enough to convince solar physicists there just might really be nothing there. I also have not found the the definitive answer. After all this mystery and speculation, I’m pretty sure there’s going to be a lot of, “Oh, that’s all?” What I have done is take another first step, but using a completely differrent approach. As far as I can determine, my approach is unique, and I am hopeful that it will prove useful. This isn’t an extension of anybody’s work. I certainly didn’t read any of the existing body of literature on planetary/barycentric hypotheses. I was somewhat aware of Landscheit’s work, but hadn’t really read any of it. I just read something about the solar system’s barycenter affecting the sunspot cycle, and decided to crunch some of my own numbers. I noticed some correlations, and wondered, “What will happen if I do this?”, and off I went. To answer Tallbloke’s question on WUWT, yes, the “planetary red line” is fully explained in the paper. That’s kind of what it’s about. Anyway, David is really, really enthusiastic about what this model has already done (if there’s any doubt, read his May 8, 2011 at 4:25 pm comment on WUWT). I am enthusiastic about what this approach might do when it grows up, but right now, it’s still in it’s infancy. Maybe it’ll stay there. I don’t know, but I am cautiously optimistic. David didn’t breach any confidentiality by publishing this plot. He asked my permission to use it in his book, and he is using it in presentations. I understand he used my name there (I haven’t seen the book), but the reaction to that plot on WUWT has been, um, interesting. I guess the lack of detail makes it more intriguing. For reasons explained in the paper, I don’t actually think we’ll have two short cycles ending in 2025, as the above plot shows. I think it’s more likely there will be one weak, longish cycle, possibly with a double peak (like cycle 4). This plot indicates a sunspot magnetic polarity reversal around 2017, but I don’t think that will happen. There. I think I’ve covered my bases, so I can say, “See, I was right” no matter what happens. I learned that “trick” from the warmists. Gerry mentioned something about the signed sunspot series. I used the monthly sunspot numbers from the NOAA ftp server. I arbitrarily assigned the current (in 2008) cycle as positive and inverted the sign of every other cycle back to the beginning of the dataset. If you want, I can go into why I did that. 2013 to 2020 is only 7yrs maximum to maximum, that needs Fixing. C24 and C25 astronomical centers are roughly early 2014 and early 2026. 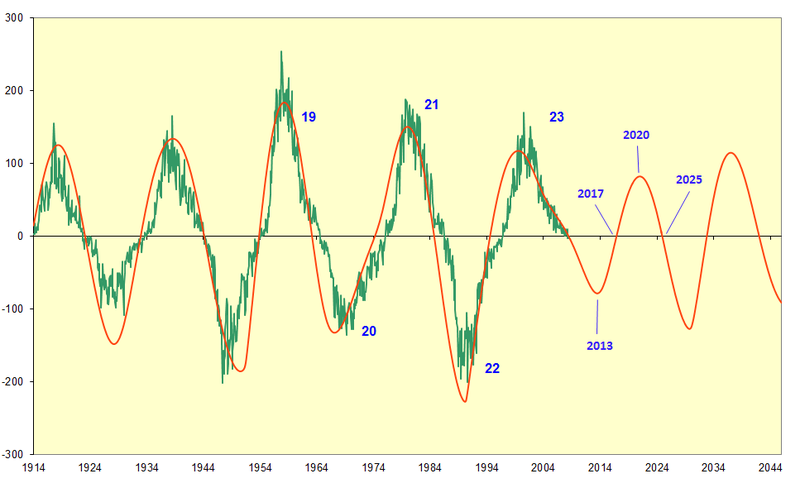 I would say, given the apparent amplitude of C24, that it should max around 2014 or even 2015 being a lower cycle. C25 max may come a little early, but nowhere as early as 2020. Tim, Desmoulins has posted comments to this blog and is happy to see his ideas being developed by us. COM or SSB, same thing, different forces implied. To me, COM is about mass – angular momentum – velocity etc. SSB is more associated with gravity, tides etc. Gerry, I could only do a rough side by side as the backgrounds to both graphs prevented an overlay. There are obvious similarities and differences. Ulric: Thanks, that requires some study to see how the timings relate to amplitudes. I’ll try to represent the info visually to see if it sheds some light. Likewise I hope Ed Fix’s forthcoming paper will clarify how the red planetary curve has been constructed and provide a similarly testable prediction. Ed was kind enough to send me a draft copy some time ago that may have changed but without giving too much away the primary input looks to be solar velocity measured from the SSB with some tweaks. Some of the model output is very close to the angular momentum output performed by Carl Smith in 2007, but interestingly Ed’s model does not hindcast the Maunder Minimum suggesting perhaps that further work maybe required. For clarity, I was asking whether the red plot from Ed Fix’s work had been plotted further back, particularly to the Dalton period. Geoff has just somewhat answered that. I guess from Ed’s post we’ll just have to wait for the paper and full explanation. Nice to here from you, hope you were not offended. Thanks for the details. Looking forward to see more. my ‘paint’ voodoo failed early this morning. My take is that the sun is going into an anomalous phase and the curves generated from planetary data won’t match as well as they do in the hindcasts since Dalton. It’s as if there”s a threshold below which the sun dithers in ways not directly indicated by planetary motion. Nicola Scafetta is into Bendandi too, along with our occasional contributoe Michele. But according to your link, Bendandi never made a prediction for tomorrow in Rome. Gotta to to work, so don’t have a lot of time this morning. Gray asked about the Maunder Minimum. Well, Gray and just about everybody else, including me. No, this model doesn’t replicate it. While that would have been cool, it’s not surprising. There are specific, known limitations of this model that make it unlikely to replicate a Maunder-like event, if the underlying hypothesis is correct. This paper describes a proof-of-concept of a specific approach. It’s not a fully developed construct. In other words, there are aspects of the underlying paradigm that this simple model intrinsically cannot model. It’s not done yet. Folks have been doing curve overlays, and having problems due to the nature of the graph David posted. When I get some time, I’ll put together a more useable graph and csv data so you can to your heart’s content. After publication, I’ll make available supplemental material with all the calculations, etc. I’m afraid, after all this hoop-la, it will seem shockingly simple. That will have to wait a bit, but the sun has been out there for some 5 billion years, give or take, so a month or two more won’t really make any difference. Now, gotta get to work. The sun is very likely variable, akin to TSI, how active it is. Impressing a timing causal onto this is likely to lead to what we see, absence of sunspots, not because the timing process has ceased but because the solar energy level is too low. Short term variation such as the visible sunspots are not the same thing. An accepted explanation for the timing of sunspot cycles would be huge progress. 11 March —–> 190 ! Do not mind new electric universe theory.. Thanks for the great superposition job. The orange curve is still somewhat of a mystery until we find out exactly if or how solar velocity was tweaked to get it. Thanks also, Ed Fix. I think it may turn out that you are being too modest about your work. We will just have to be patient and give you time to write it up. In the meantime, I’m sure you can count on Tallbloke and his commenters to not launch any vitriolic attacks against what you have done! Well it was not Italy, it was Spain strongest for 50 years. Coincidence? it would be to much to expect, that Bendandi if he predicted it, to predict location as well. Note to folks on this thread. I might have taken focus off this thread too soon by putting up a new thread. This was just how things fell out. The subject of Ed Fix, Archibald and so on is important. Hope it will resurface in it’s due course. At some point I will headline a discussion about what kind of thing, how often, new items should appear and so on about the blog. This is about me understanding what you want. Figures A1 and A2 plot these series from 1750 to present. Whereas the solar angular momentum series at the start of the current solar minimum (2008) correlates very well with the solar angular momentum series at the start of the Maunder Minimum (1650), it is seen that the angular momentum and postion plots at the start of the Dalton Minimum around 1795 correlate equally well to the angular momentum and position plots around 1980, but not at all to 2008. In addition, the phase of the signed sunspot series in 1795 is maintained in 1980, and 2008 occurs 1.5 signed cycles later. 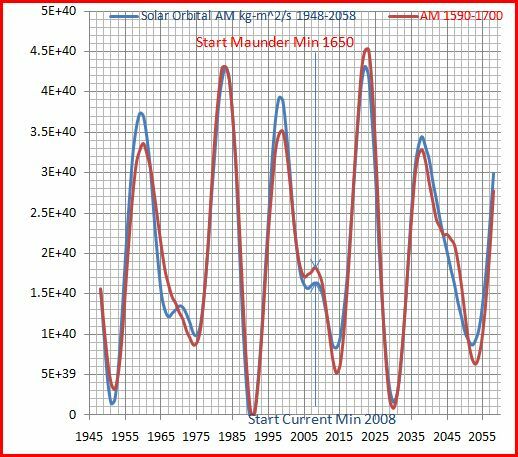 I conclude that the current solar minimum has an apparent dynamical resonance with the Maunder Minimum that is not seen with respect to the Dalton Minimum. I was always under the impression that the planetary electromagnetic field strength when looked at in terms of barycentre motion was the dominant force in governing solar polar magnetic field strength. This then determines the magnetic field currents as seen within the sun, and by extension the sunspot cycle. How does one determine cause and effect in a system such as this? Do we simply look at the biggest and most obvious things in a closed system and then work our way down adding in more and more detail from any contributing factor we deem noteworthy? Or do we play with the data until it begins to replicate our observations? I have noted that Ed’s data models always seem to be quite smoothed and somewhat lacking in detail, I hope that he incorporates some added avenues of detail when the time comes that he publishes his work. I look forward to more people such as Ed and David having their work acknowledged. The correlation in data certainly suggests that they are on the right track.